Quarterly Summary: At 610 Court Street work began on installing an HVAC mini-split system and a T-Bar ceiling grid in Suite 102. 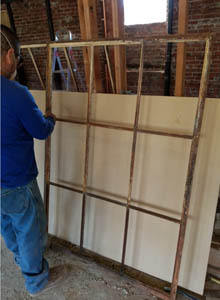 At 630 Court Street a steel window frame was restored, a missing window sill was reproduced, and measurements were taken to create a revision to the plans. 610 Court Street: A plywood “drop-down box” or soffit, projecting off the wall and the ceiling, between two windows, was installed. The plywood will act as a backing to secure an HVAC mini-split system for the suite. 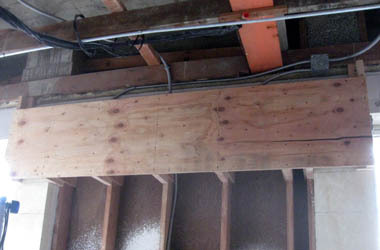 The space behind the plywood will be used for the HVAC plumbing connections. At the two ends of the “box” there will be electrical outlets to supply power for any future window signage. 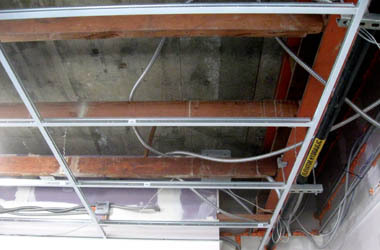 610 Court Street: A suspended (T-Bar) ceiling grid was installed in Suite 102..
630 Court Street: Work began on resoring a steel window frame. 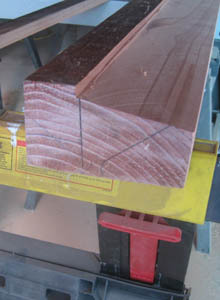 630 Court Street: A window sill was manufactured on-site to match an existing one on the exterior of the building. 630 Court Street: Upon demolition of the sheetrock and studs covering the rear brick wall of the building, it was discovered that the wall was not constructed as the engineer had anticipated. 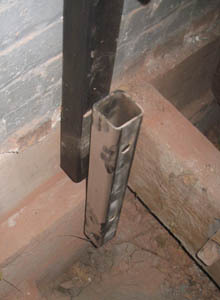 In this image, a worker is using scrap iron to create a mock-up of a “foundation leg” for a proposed X-brace, so the engineer can get an idea of how it will fit against the existing foundation, and so changes to the seismic retrofit plans can be drafted. 630 Court Street: Using scrap metal, a worker tests for clearances to make sure a proposed steel X-brace will fit between the bricks and the outside facing surface of the existing steel columns. 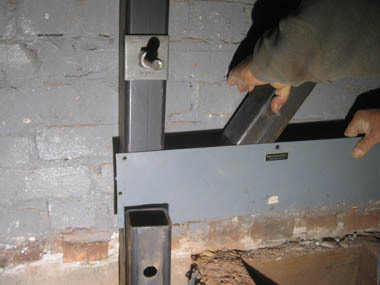 This test was required so that changes to the plans could be drafted due to unanticipated construction methods used in the original construction of the adjacent brick wall.